This is where I wish we got 8 straight hours of sleep. Sadly, it's just about 2 or 3 hours at a time right now. Katie is still sleeping in our room in the pack and play. It just feels more convenient to just have to stumble a few feet to get her. I am starting to maybe possibly thinking about putting her in her own room. maybe...someday. That sign says, "We may not have it all together, but together we have it all." So true! This was the room before we moved in. 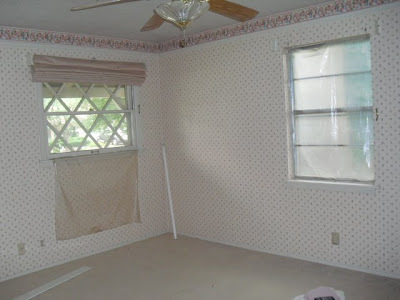 I covered the window with an old window and put leopard wrapping paper on the back of it for privacy. I didn't want to have curtains behind my bed. The headboard covers the rest of the window. Katie is wondering why the bed is made. Who is coming over? The tag on the right of that boppy has the word sleep on it with a big red circle and line through it. Do you think they mean my baby shouldn't be sleeping in the boppy? Do they have a baby? I would let her sleep on a bag of glass at this point. I am joining in Show and Tell Friday at My Romantic Home. Join the party! 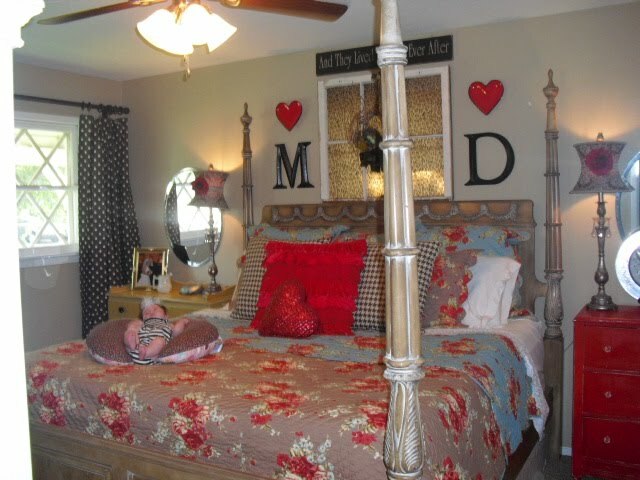 I LOVE your bedroom! Katie is beautiful! The window idea is awesome...I would have never thought of that!! 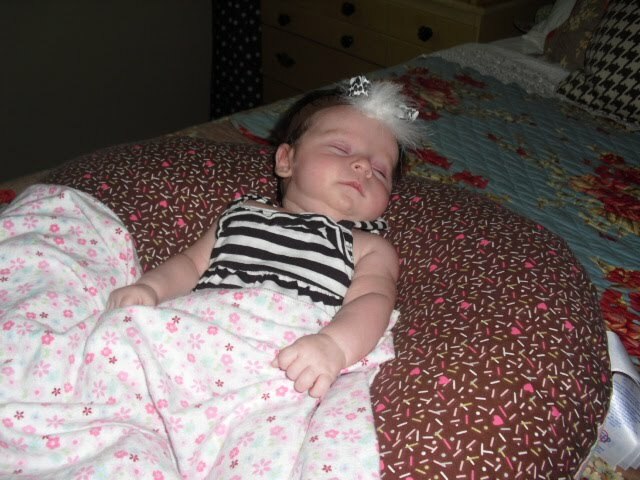 Lauren used to sleep on the boppy as well, because that's where she fell asleep while I fed her. I think as long as you don't just leave her alone sleeping on it for hours at a time...she should be ok! And that 2-3 hours of sleep WILL get better, promise!! Katie is a sweetie!! So precious!! i'm in love with this room. especially the initials with hearts over them. i'm begging you, please design my house! ha! p.p.s. both my kids slept on their boppy pillows. i loved it. and Jovie is still in our room (at age 7 months) in our closet. b/c Jack is still using the crib! she doesn't know the difference! ha! Love the room, you're so creative! Bag of glass....LOL! That's funny right there, I don't care who ya are! My babies slept on a bobby pillow and you know what, they lived! 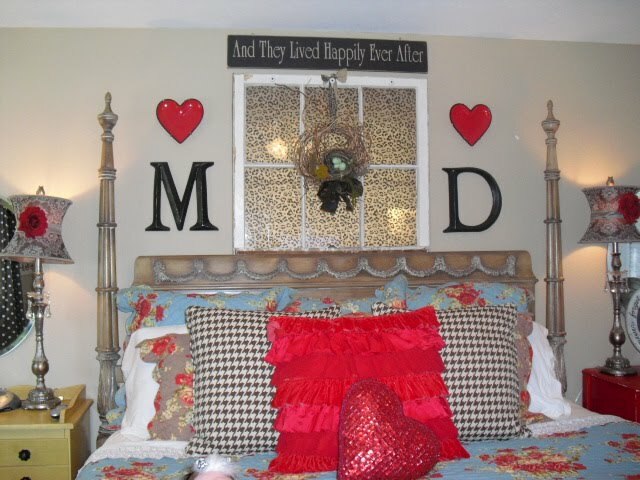 I love your bedroom!!! We've been looking for ideas for our bedroom. It's quite boring!! How did you apply the leopard print paper to the window? Such a cute and fun idea! And you can change it up as you want!! Love it!!! Love it....and I love the idea to cover the window that is behind the bed like that...clever and so so super. 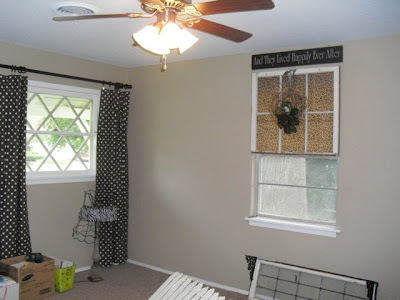 LOVE LOVE your blog and your house is an inspiration! 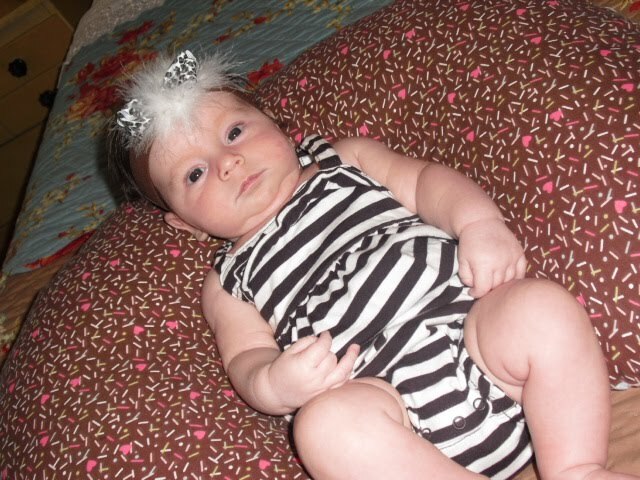 No worries, my baby girl Braelyn would only sleep in her boppy for the first 7weeks of her life. When she was 8weeks I decided that I was moving her to her bed and that the bobby was not coming along. It wasn't an option because I wouldn't have her right next to me. She actually slept a lot better in her own bed. Good luck! Little Katie is adorable! 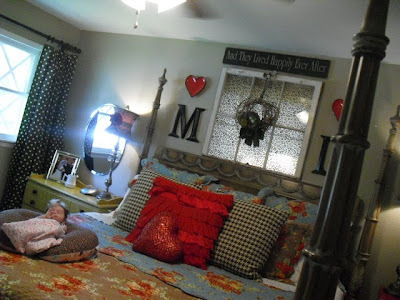 Love your bed...and your little one is so cute! I'd love for you to come join in the fun, on my other blog, It's A Blog Party. I host a different linky everyday, Fridays are all about decorating! You are hilarious...Trevor (10 weeks) sleeps IN the boppy lounger IN the pack n play IN our room every night. I still have to re-paci him a few times a night so I'm not willing to walk across the house to just do that! Your room is really cute. The room is beautiful but the baby is gorgeous! So sweet. Oh my. BTW-- we have a unique kitchen backsplash giveaway that might be useful to you or a friend. Please stop by our Giveaway Friday! Jane F.
Your room is PRECIOUS!!! When I saw Miss Katie alseep on the boppy pillow you do not understand the sense of relief I had!! I have a 3 week old and she LOVES( I love it too) to sleep on her boppy! Everytime I lay her down my eyes always seem to drift to the big tag on the side that says SLEEP with the big NO sign through it!! Have a great weekend!!! the bedroom is quite lovely!!!!!!!!! I love the red and turquoise together....fun, and the window idea...phenominal!!! that baby that's sleeping on the boppy, that's against the law and I'm calling enforcements.....HA! 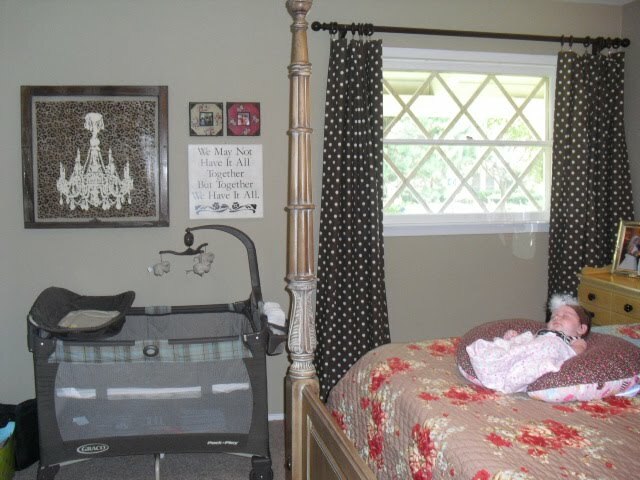 Great room, but best of all is that sweet little doll asleep on your bed. Precious! Loving your bedroom and the creative window treatment!! I would never have thought abt doing that with an old window! Katie is sooo precious! cute cute...i thought the "M" and "D" were for "Mom" and "Dad"...BUT just realized they are proabaly for "Marcus" and "Dina"! haha! Well, Now, you can sleep on either side of the bed and feel "ownership" of that side! :) Cute baby...love her rolly polly legs! !